Kenan Christiansen Antonio Garcia, the street artist known as Chico, recently received commissions for 10 new neighborhood murals, including this in-progress work outside Whiskers pet supply store on Ninth Street. 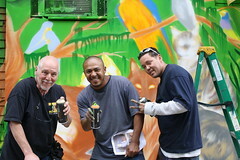 Below (from left), Phil Klein, a co-owner of Whiskers, Mr. Garcia and artist Joel Salas. 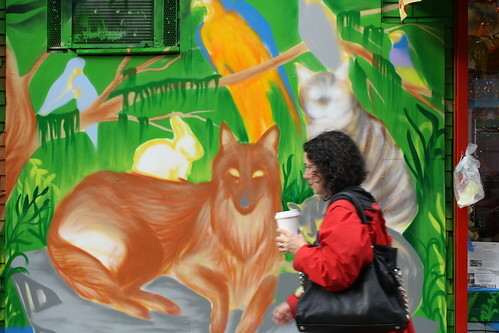 It’s hard to walk around the East Village and not run into a mural by Antonio Garcia, who’s known to almost everyone by his nom de spraypaint, Chico. The locally born graffiti artist has spent most of his 34-year-career dedicated to painting the public walls of the neighborhood with lush murals often directly inspired by contemporary events. When he was laid off from his job at NYC Housing in 2008 he left the city to live in Florida with his family. And even though he’s only been in the city a few weeks his murals have already began to proliferate. On his most recent trip, sponsored by Branson B. Champagne, Mr. Garcia painted a mural celebrating the royal wedding on a wall in East Houston and Avenue B. The job only took 12 hours and he soon had more projects lined up. 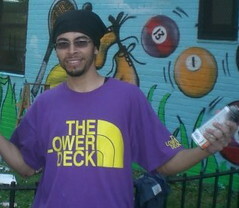 Before he leaves on June 24, Mr. Garcia agreed to 10 new mural projects in the neighborhood. Courtesy Antonio GarciaJairo Pastoressa was deemed “mentally unfit” to stand trial in the Oct. 25 murder of Christopher Jusko. In the days since Christopher Jusko was killed, his step-sister, Christina Rumpf, has ridden a range of emotions, heightened since Wednesday when she learned that the man who the authorities said fatally stabbed Mr. Jusko has been deemed “mentally unfit” to stand trial. Now, Ms. Rumpf feels sadness for what she says is essentially the loss of two young lives. On Wednesday, Jairo Pastoressa, 25 – who the authorities said killed Mr. Jusko Oct. 25 after a dispute over a woman in whom both had a romantic interest – was ordered to undergo treatment at the Kirby Forensic Psychiatric Center on Ward’s Island. Ms. Rumpf learned of the development from The Local and said that her family continues to cope with the loss of Mr. Jusko, who was 21.